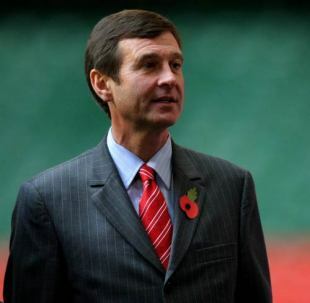 WRU chief executive Roger Lewis has echoed Wales coach Warren Gatland's criticism of Premier Rugby's player release stance prior to next year's Rugby World Cup. Gatland hit out at the governing body of the 12 Aviva Premiership clubs on Monday for enforcing an IRB guideline on player access, one that means his England-based players cannot link up with the national squad until August 4, 2011. Lewis has now threatened to bypass Premier Rugby in order to speak to the Rugby Football Union directly over the matter. "We're absolutely bemused, as is the rugby world, at the behaviour of Premier Rugby," Lewis told BBC Wales. "Premier Rugby Limited… has written to us but obviously the most important body in England is the Rugby Football Union, they are the governing body for the sport, and it's they we will talk to about this. "We'll certainly speak to the Rugby Football Union but we're not going to negotiate on this, we're not going to be held to ransom... those days are well behind us in Wales. We have proper agreements in place and we behave honourably so, no, we're not going to negotiate, it's outrageous. "That said, it's not a big issue for us in Wales because [most of] our players are playing in Wales. It's a big issue for Scotland because so many of their players are playing their rugby in England, but also it's a huge issue for countries such as Fiji, Samoa, Tonga, Argentina. I think it is scandalous that this pressure is being put on those countries and it's a deeply sad day for rugby." Premier Rugby boss Mark McCafferty has reacted in a similar manner however, criticising the WRU for their handling of the issue and lack of communication. "I'm staggered frankly that it has been raised as an issue," he said. "We don't make these rules. The International Rugby Board makes these rules and … and my understanding is that the Welsh Rugby Union voted in favour... when those new rules were introduced in 2009. "I'm just really disappointed that Roger Lewis has said he won't talk to us. We are having constructive discussions with a couple of other unions, and I'm sure this is not insurmountable. We are not going to stop any player preparing properly for his country for a World Cup. "So it seems to us to have come out of the blue and particularly come out of the blue against a background where a) the Welsh Rugby Union wrote the rules and b) the chief executive [Lewis] won't speak to us."